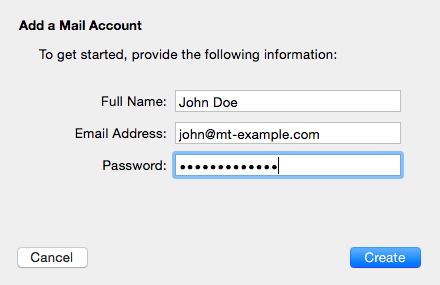 Apple Mail is the default email client that comes with every Mac using OS X 10.0 or later. 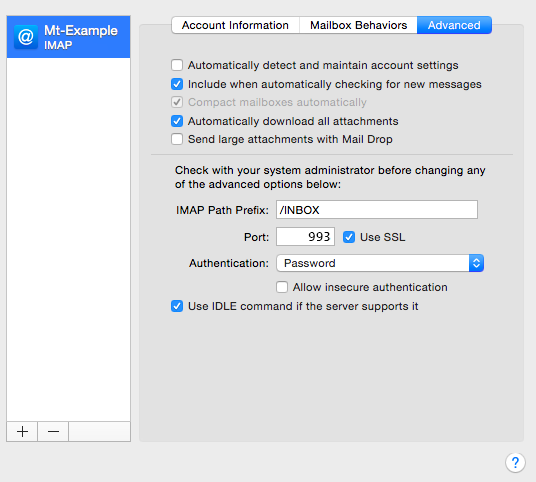 This guide will show you how to configure your Apple Mail application to access email for your Media Temple server. Additional steps for older versions of Apple Mail that were released prior to Sierra have been included. For more information, please read this article: Creating a POP/IMAP email accountCreating a POP/IMAP email account. Your email access domain. The email access domain is completely independent of the web access domain and will look something like this: xxxx-xxxx.accessdomain.com. The "xxxx-xxxx" string will be a series of randomized letters. This will be totally unique to your specific Grid. Read our article What is an "Access Domain"? for more information. 1. Open Mail. If you haven't added a new account yet, you'll be taken directly to the Add Account prompt. If you're adding an additional account, or this prompt doesn't otherwise load automatically, you'll need to select Add Account from the Mail menu. 2. From the Add Account prompt, select Add Other Mail Account... and click Continue. 3. Enter your email account information and click create. 4. Mail will attempt to contact the mail server. The default search uses "autodiscover.example.com" -- unless you have this subdomain already created and an SSL Certificate installed, this will not work. However, don't worry! It's normal for this to happen due to Media Temple's servers not having autodiscover settings enabled by default. When an autodiscover setting has been unsuccessful, the message "Unable to verify account name or password" will appear in a new settings box. 5. Fill in the fields using your email info and access domain. If you do not see this box and are using a version of Apple Mail that was released prior to OSX Sierra, skip to "Additional steps for older versions of apple mail". Account Type: We strongly recommend connecting via IMAP. To learn more, please see Using Email: How IMAP worksUsing Email: How IMAP works. 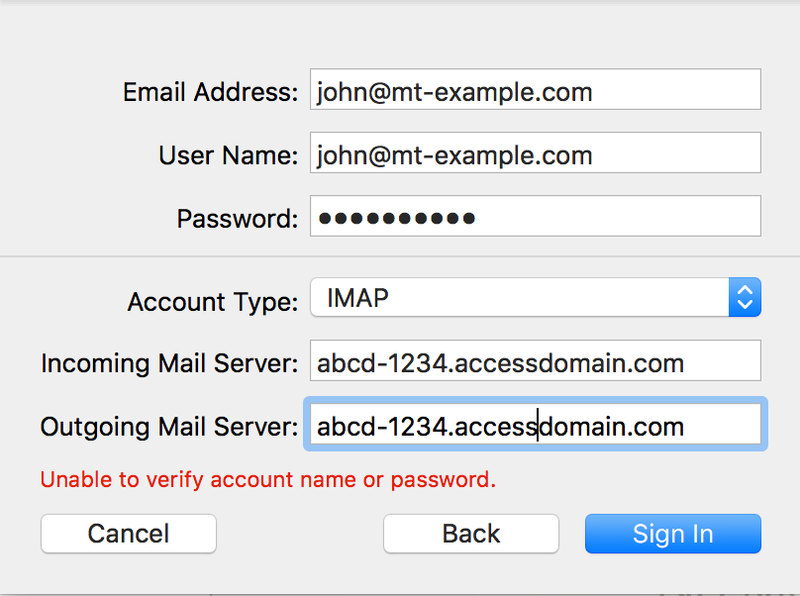 Incoming Mail Server: Your email access domain. Outgoing Mail Server: Your email access domain. 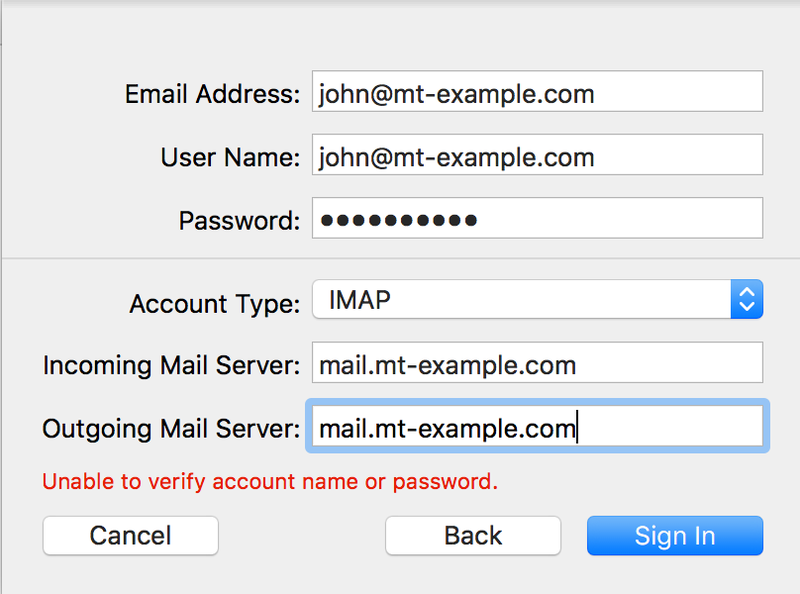 Please note that by default, Apple Mail versions 10 and higher use secure (SSL) connections for both incoming and outgoing servers. We highly recommend that you do not change this, but SSL and port settings may be modified under server settings in the preferences menu once setup is complete. 6. You'll then be asked to confirm which apps that you'd like to attach the email account to. Select email and any others that you'd like and click Done. That's it! You just configured your Media Temple email address on Apple Mail. As always, if you have any questions, please feel free contact Media Temple's award winning 24/7 support. To maintain functionality and security, Media Temple recommends that you update to the latest Apple Mail version available. We strongly recommend connecting via IMAP. To learn more, please see Using Email: How IMAP worksUsing Email: How IMAP works. Path Prefix: Enter /INBOX here (all capital letters). Port: You will want to connect using the correct port based on the settings you have selected. IMAP: 143, or 993 if SSL is enabled. POP: 110, or 995 if SSL is enabled. SMTP: 587, or 465 if SSL is enabled. For incoming mail, we recommend using Port 993 with the Use SSL checkbox selected. SSL Checkbox: Check this box if you wish to connect using SSL encryption. 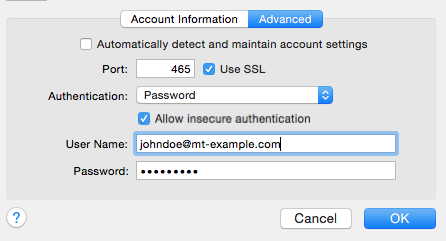 This feature is supported by default and you do not need to install an SSL for it to work. 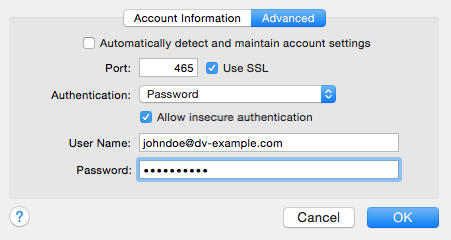 Note that you will also need to use an SSL port (above) if you select this option. You may encounter an Unverified SSL Certificate warning if you have chosen to connect with SSL. This is common if you do not have your own SSL Certificate installed. You can add the certificate to your trust settings to avoid seeing this message in the future. The encryption in use IS safe, so you can safely select "Connect" to continue. You may encounter an Unverified SSL Certificate warning if you have chosen to connect with SSL. This is common if you do not have your own SSL Certificate installed. The Grid does not allow you to install your own SSL on email. To avoid seeing this message in the future, add the existing certificate to your trust settings. The encryption in use IS safe, so you can safely select "Connect" to continue. Your email account has been created, but you'll want to verify a few steps before you get started. 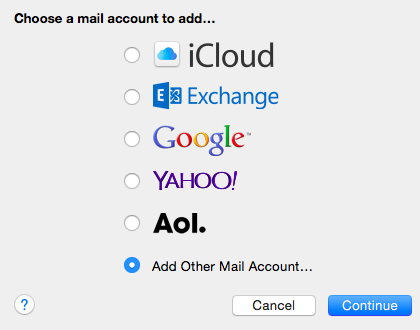 Select "Preferences" from the Mail menu, and click on the "Accounts" tab from the Preferences window. Select your new account from the left hand column. Click the "Advanced" tab and uncheck the box to "Automatically detect and maintain account settings." Navigate back to the "Account Information" tab. This time, select Edit SMTP Server List... from the Outgoing Mail Server (SMTP) drop-down menu. Be sure the box to "Automatically detect and maintain account settings" is not checked! Enter your desired outgoing mail port. Since many ISPs block port 25 (the default outgoing mail port), we strongly suggest using port 587, or port 465 if SSL is enabled. Select "Password" from the Authentication drop-down menu, and make sure the "Allow insecure authentication" box IS checked. 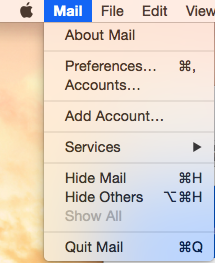 If you don't see this option, you may need to update Apple Mail or Yosemite to the newest version.